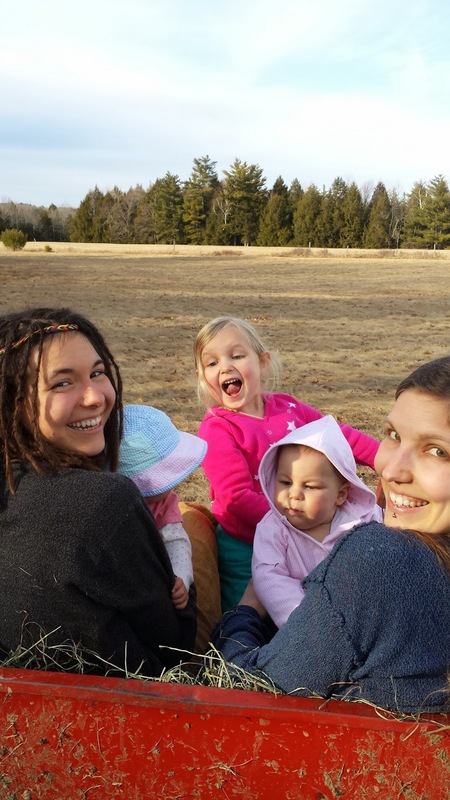 The Wild Hare Farm - Our Journey Toward Manifesting Our Own Eden On Earth: New Additions! This post is going to be a bit here-and-there-and-everywhere, because I have a lot of thoughts today. 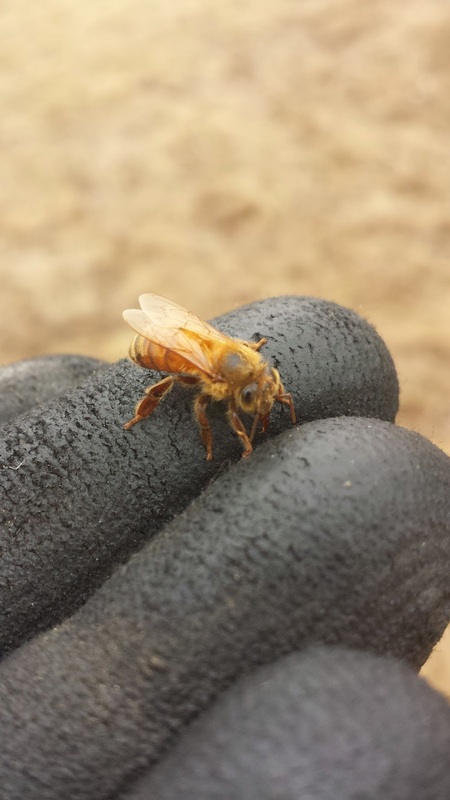 I am establishing an organization to promote practices and methods to support all pollinators, and to support beekeeping as a hobby. 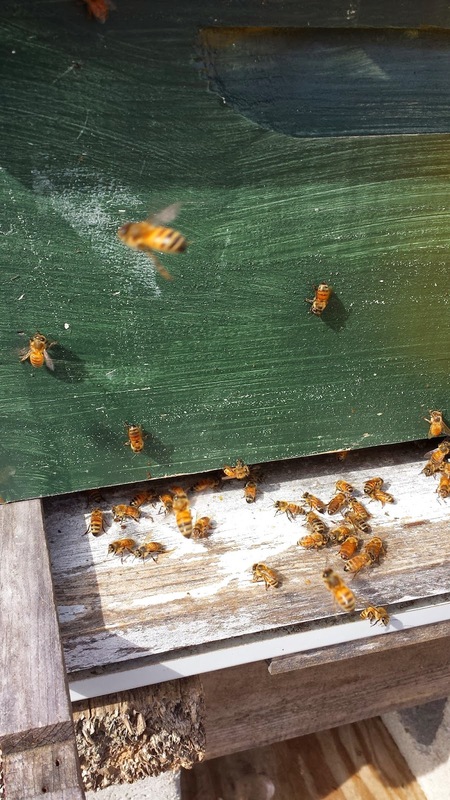 We had spoken to him in the past about our interest in beekeeping, and recently he set us up with our own beehive and gave us our own bees!!! They arrived this past Monday, and we set them up in front of the little pond in our front yard. 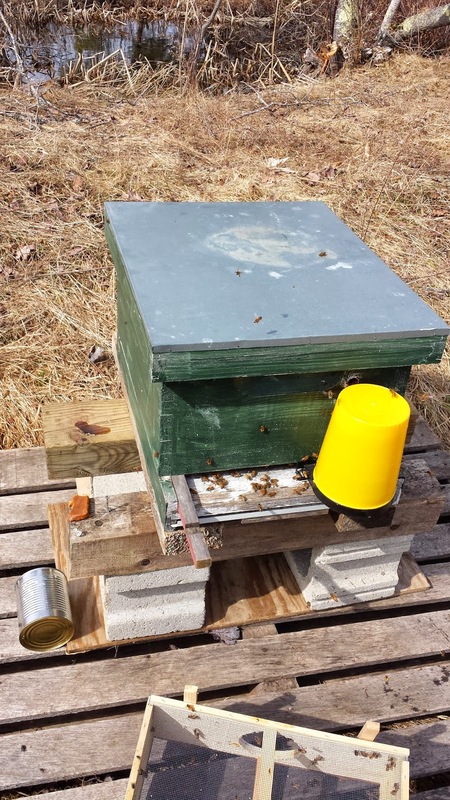 This was just after installing the bees. I know... that sounds weird. They aren't an electronic device after all.... but that's what it's called! Flight of the Honey Bee! We have had to feed them sugar water for now until the flowers start to bloom. Between those and the garden which we hope to put in this year, our property will be alive and well!!! 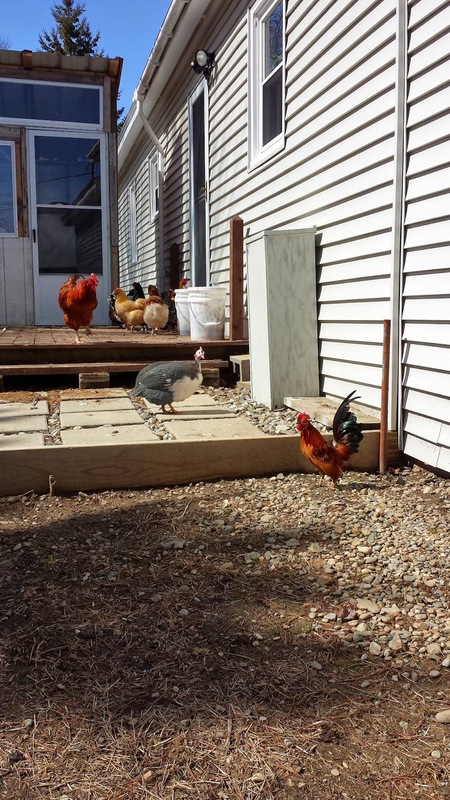 In addition to the bees, we welcomed two new poultry pals into our flock recently. 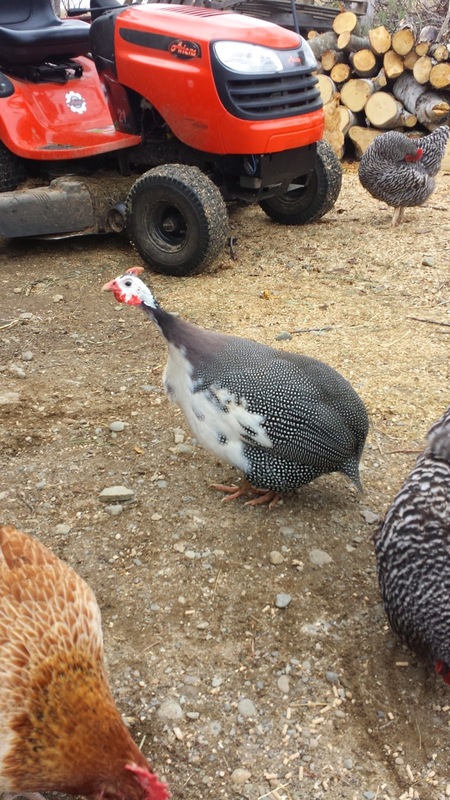 Meet our guinea hen, who our friend have lovingly nicknamed "Flannery O'Connor." She's super neat, and super noisy as well. Wanna know what guinea hens sound like? Take a listen! And yes, she does tend to make that sound for much of the day sometimes. You get used to it..... mostly. And today I went and picked up the absolute most adorable freakin' rooster on the face of the planet (yes, I'm serious). 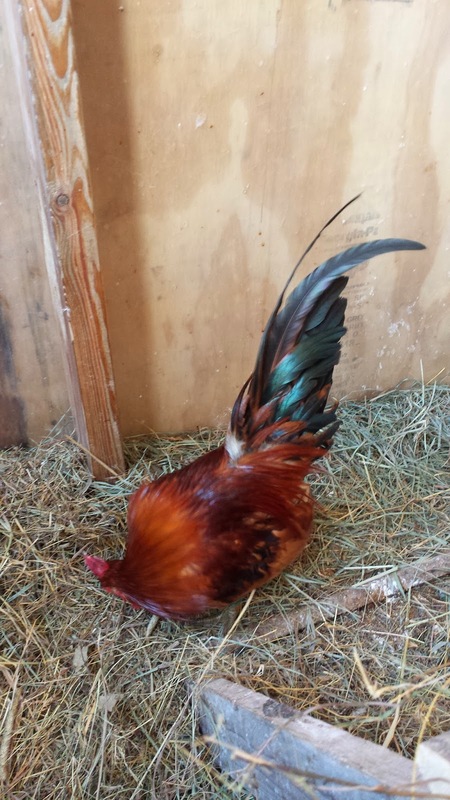 He's a Serama rooster, and they are tiny compared to your average-sized chicken. Lookie!!! That's him in the front lower-right. So small!! Maya got to introduce him to his new coop! We also had (have) the potential to acquire two baby goats for dairy purposes, but as of right now we don't know how we would be able to afford them. They are 2 - 3 weeks away from weaning, which would mean that we would have to provide them with milk until they are finished. This equals a little over $100 for those few weeks. Then we would need money to get their shots and supplies for milking, as well as some more materials to build an outdoor pen. In all honesty we would LOVE to take the goats! Fresh milk every day and hilarious, adorable, fascinating companionship would be so fantastic! And this is all part of where our GoFundMe campaign comes in again. Financial stress has been getting the better of me lately. I get frustrated (and sometimes angry) that it is so much harder to afford working from home... working YOUR LAND... being together as a family every day, growing your own food, benefiting your community.... it is so much harder to do these things than to go out and get a 40 hour a week job, working for someone else, and missing out on things you'd rather be doing at home (and please don't chastise me for saying this... I know that there are a lot of folks who WANT to work outside of the home and love what they do, and that's awesome. I'm talking about my personal feelings on the subject). We bought our house because we wanted to settle down and create a little piece of Heaven on Earth in our own backyard (and frontyard... and inside the house... you get it). We wanted to own something that - because of the love and work we put into it - flourished and bloomed and provided the most wonderful food, medicine, companionship, health, and joy that we could use for ourselves and share with our community. And we are creating that right now, but it feels very challenging. We aren't making any money off of it yet because we're just starting out. If either of us got a full-time job outside of the home, then we'd never accomplish anything here. People are already interested in our rabbit meat. We will have honey to sell next year. 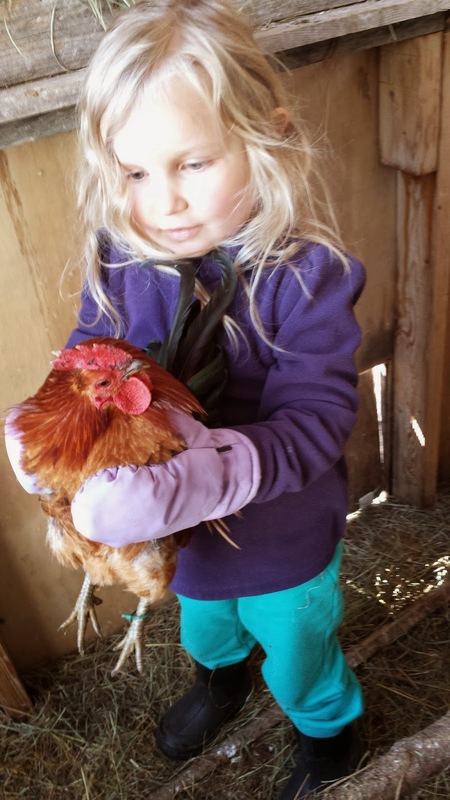 If we could build a bigger coop we could get more chickens and sell eggs and meat birds. If I could acquire the ingredients I use most in bulk, I could start selling soups and baked goods from home! There are so many possibilities, we just need the start-up money to move ahead. We are definitely looking into our options. I know it sounds like I'm complaining, and I guess to a point I am a little.... In reality, though, I know that we will succeed no matter what. This is what we've wanted for a long time, and it's happening, much more quickly than we imagined it would! I'm holding on to that hope, and that feeling of success, because I know that these things (plus visualization and a little magic) make manifestations come to life so much easier. So if you haven't already (or if you have, but want to again), please consider supporting our efforts! We will be tanning our rabbit hides starting this Spring, and as promised, everyone who donates will receive one (and those who donate larger amounts will receive a handmade good created with a hide, feathers, etc. from our farm)!